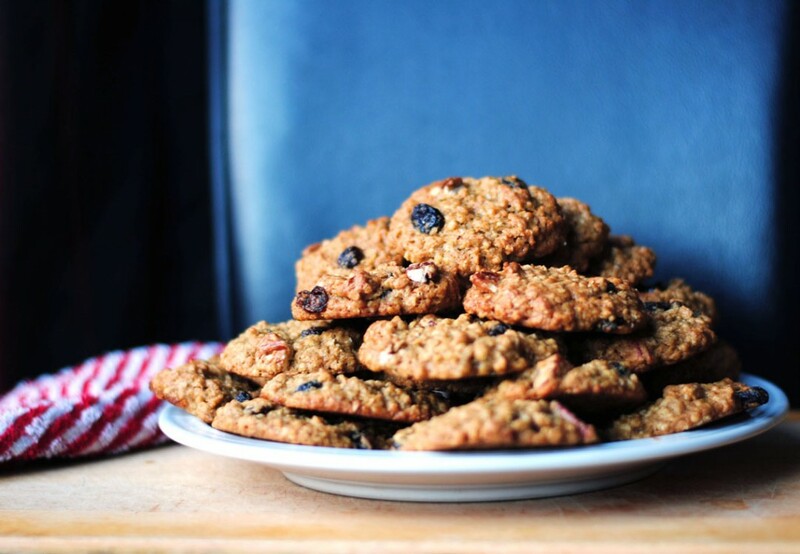 These oatmeal cookies are slightly crispy around the edges but soft and chewy in the middle, with tangy cranberries and a handful of pecans to add some crunch. We might be looking at cookie perfection here, folks. I’ve been trying to get in better shape. Maybe that’s a weird way to start a post about cookies. It probably is. The thing is, I’m currently unemployed in a period of professional transition, and I’ve had lots of free time lately. So, I’ve been trying to exercise more regularly and with more motivation than before. It makes me feel better, both physically and emotionally, so being lazy about it is really just cheating myself! I’ve been doing yoga, along with some weights and regular cardio, and I even started weekly sessions with a personal trainer to help me keep on track and push me a bit more than I’d push myself. After our second session, my trainer asked if I would keep a food diary for a week. I wasn’t very comfortable with the idea, because frankly, I like the way I eat. I eat so many vegetables. Like, all the vegetables. Dark leafy greens? Bonus. Fruit! I eat fruit every day. I eat whole grains. I’m basically the queen of legumes. I eat some meat, but not too much. Same with dairy. I’m pretty much the definition of a balanced diet. I also eat cookies, and they’re an integral part of that balanced diet. So, Mr. Trainerman, I’ll write your stinking food diary, but hear this: you can make me do a hundred million lunges, you can make me do high knees until I’m ready to fall on the floor and you can even make me humiliate myself in front of the whole gym (ok, four other people who weren’t paying any attention) by trying to do pull-ups, but you cannot make me give up my cookies. 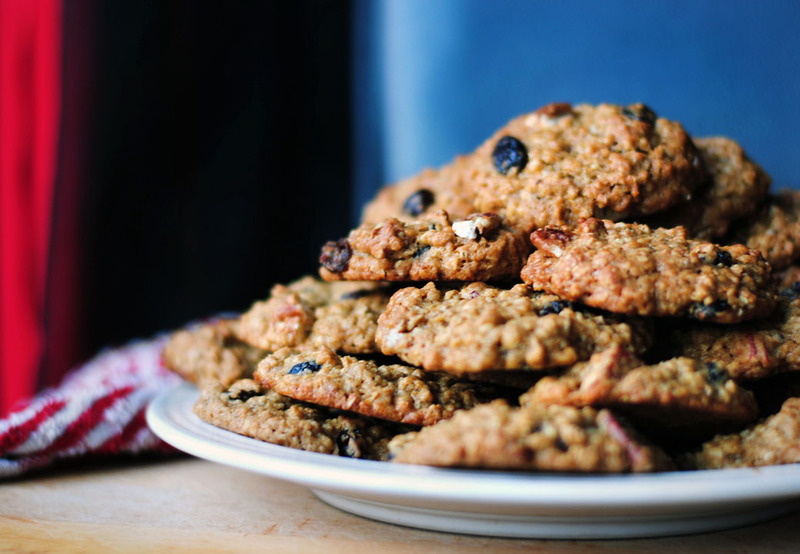 Besides, these cookies are almost healthy. They have oats, and dried fruit, and nuts, and uh… let’s not talk about the butter. The important thing is, they’re delicious and they make me feel wonderful. They’ll make you feel wonderful too, I promise. Just a wee bit crispy around the edges, but oh-so-soft and chewy on the inside. I like mine with cranberries and pecans, but you might prefer dark chocolate chunks or coconut. Go for it, friends! Um, speaking of cookies (?!) I saw on Facebook today that Michelle Obama is organizing a social media campaign to encourage healthy habits and celebrate the 5 year anniversary of her “Let’s Move” program. To participate, just share 5 ways that you’re actively staying healthy and tag your post #gimmefive. It’s a great cause and takes just a second to do, so get crackin’! My five healthy habits are up on on Twitter under the username @chubbysoulblog. This recipe is pretty much foolproof. 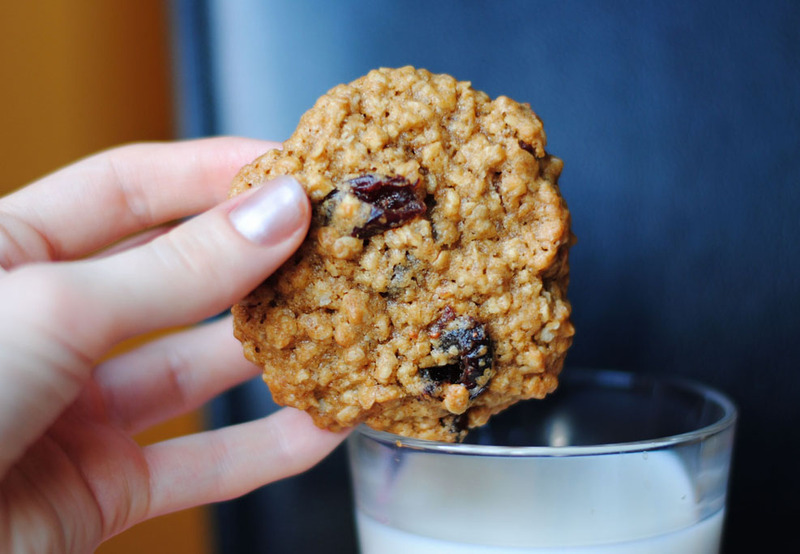 I've made these with several different kinds of oats and they've always been delicious. I've also added different spices, like nutmeg and clove. For some variety, try adding other ingredients like raisins, dark chocolate chunks, coconut, other varieties of nuts, peanut butter chips, or m&m's. In a large mixing bowl, cream together butter, brown sugar and white sugar. Beat in eggs one at a time, then add vanilla. Combine flour, baking soda, salt and cinnamon, then mix into the creamed mixture. Add oats and mix until thoroughly combined. Fold in cranberries and dried pecans. Cover and chill dough for an hour. Preheat oven to 350ºF/175ºC. Form dough into walnut sized balls and place on a cookie sheet lined with parchment paper, around 2 inches apart. Bake for 10 minutes, until the edges are beginning to brown slightly. Remove from oven and let cool for about 5 minutes, then transfer to a cooling rack to completely cool. They look delicious! So glad you’re taking good care of yourself. My five ways are: planking, the “superman” exercise, dancing daily, not smoking, and not making your Irish coffee ice cream very often!